March and April 2018 have been travelled and enjoyed at an amazing pace. Between the part-time work and experiencing the day-to-day journey – our life is nicely occupied; to the degree we want. It is sometimes commented that with retirement one might be bored or have little to do. In my situation this is certainly not true. I believe it’s all about your mindset and being content with one’s own situation. Perhaps for me; the early days of traveling extensively, experiencing and enjoying many different world locations, doing different jobs and interacting with so many different people over the years has allowed me to be content with myself retreating in Chiang Mai. What follows in this blog post are a few of the journey experiences and activities we enjoyed over the past couple of months and insights about living in Chiang Mai. It has been relatively routine, low-key and less adventurous than I would like – due to some on going medical matters – that have kept us closer to home. I wasn’t sure about putting a post together for this period, as I didn’t think there was much to share, but for family, friends or those thinking of moving to Chiang Mai I have decided to put something together. 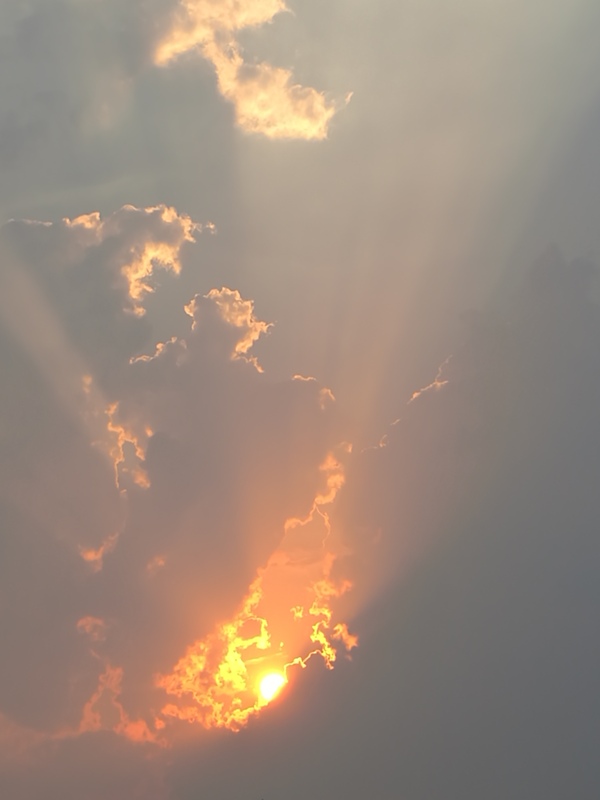 In this post I talk about surviving the burning season, getting out and about, spending time around home, cost of various repairs, medical matters and generally being busy. The Chiang Mai air quality and the environment has returned to a normal and enjoyable state following the annual smoke season. I post about this for anyone contemplating coming to live here in the North of Thailand. So what is the big deal about the air quality? Well each year the wonderful blue skies and tropical northern landscape is frequently hidden due to the smoke haze. This is created by the annual burning season in Northern Thailand and surrounding countries such as Myanmar, Laos, Burma and China – it creates poor air quality and at times some hazardous breathing conditions. March and April are the worst and this year it was particularly bad. The smoky season is caused by several different factors. Instead of me going into the detail there is already a lot of information on the internet. Here are links to a couple of good articles – Chiang Mai City Life – and – Chiang Mai burning season – what it is, when it happens and what it means – check it out. Another good source to monitor the Chiang Mai air quality index (AQI) information can be found at this website – AirVisual. 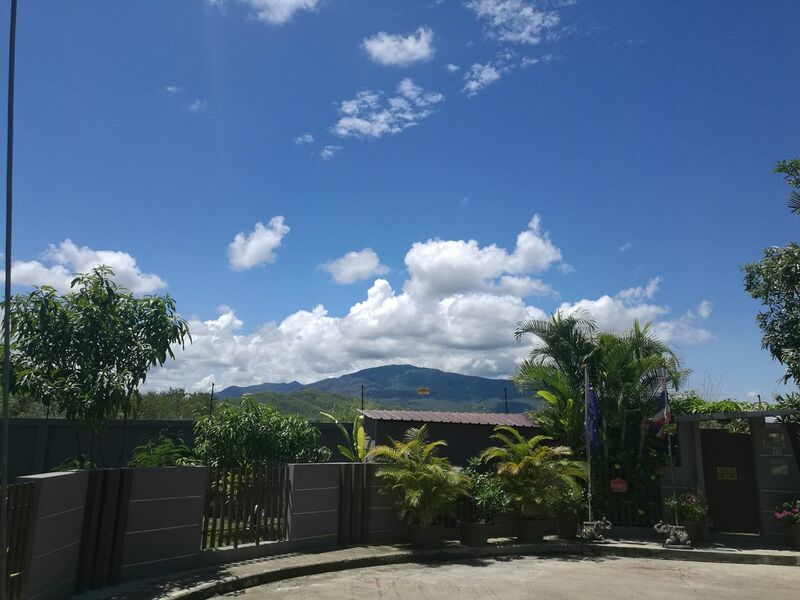 For now its back to good air and nice skies – awaiting the arrival of the annual rainy season later in May or June. It has already started a little bit with a few storms and lots of rain – this is wonderful for the gardens and water supply for our damns. We have two local damns that are currently 59% and 29% full so will likely improve during the rainy season. There is lots to do and get involved with in Chiang Mai, if you wish to. You can live an active or inactive lifestyle of your choosing with such things to do as: Attending festivals, galleries & movies, enjoying night life, dinning out food experiences, belonging to clubs and groups, undertaking education & cooking courses, enjoying tourist and cultural attractions and participating in adventure activities, trekking and photography to name but a few. Here are some of the things we have been up to as full time residence over the past couple of months. Thailand recognise the significance of the elephant by making March 13 the National Thai Elephant (chang Thai) Day. Various events take place in elephant parks, sanctuaries, zoo’s and throughout the country that involve treating elephants to nice banquets of treats such as fruit and sugar cane. In some cases, Buddhist ceremonies are held to bring good luck for the elephant and its handler (mahout). 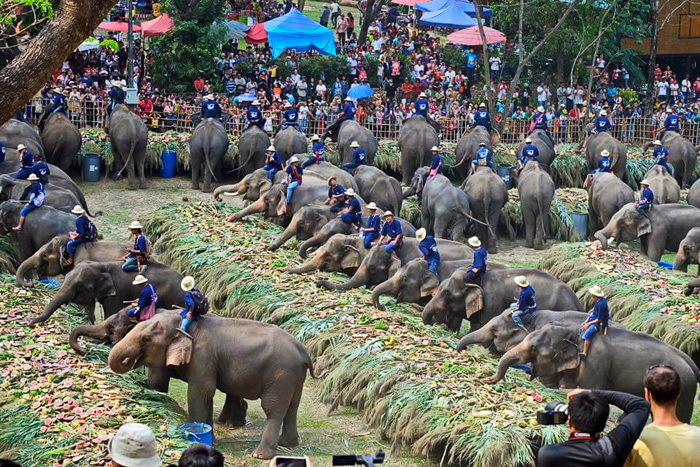 There are events around Chiang Mai where you can experience this special and unique day. 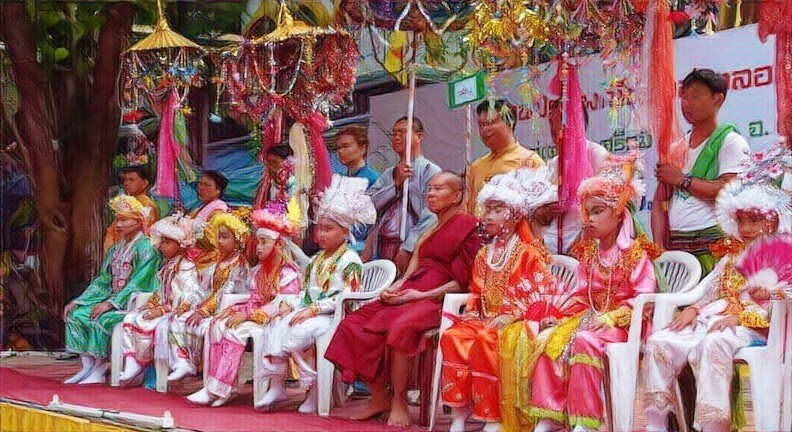 The Poy Sang Long Festival or the “Festival of the Crystal Sons” is a rite of passage ceremony among the Shan people’s both in Myanmar and in Northern Thailand. It takes place each year usually between March 20th and mid-April and Shan (Tai Yai) boys between seven and fourteen years of age participate, at some point. Not only are the boy’s proud parents and relatives involved in the excitement but visitors from other parts of Thailand come to see and photograph the spectacle. It is worth going along to see the colour and festival atmosphere. If you are interested here is a previous post I did on this festival. The annual Songkran Water Festival which welcomes in the traditional Thai New Year is one of those events that has to be experienced in person to appreciate the uniqueness of the event. In Thailand, Songkran is an annual nationwide party from April 13-15. These dates are fixed and are also a public holiday in Thailand. There is playful water throwing taking place in villages and cities all over the country. Whilst it’s the water throwing and party atmosphere that enthralls most tourists there is more to the festivities. The Songkran New Year Festival is an event steeped in tradition and meaning for Thai Buddhists. There are many temple ceremonies that are more traditional with water pouring not throwing. For visitors it is a must see and participate event but for many living here longer term after being involved once or twice is enough and many stay home to remain dry during the event. We decided to keep away & dry this year. Food Culture – Either as a result of working or just get out to explore and enjoy new settings there is always yummy opportunities. Great food and sweet treats are always on offer at the many eateries dotted around Chiang Mai and surrounding vicinities. Thailand is a place for those that enjoy food – a foodies culture. In Chiang Mai we are spoiled for choice of not only Thai food but food from many and diverse countries. These pictures highlight some of the food dishes we have enjoyed recently. Coffee shops and restaurants – We regularly make return visit to our fav spots but we like to try some new places on occasion but unfortunately we didn’t get to many new spots in the past two months. We did get to check out these two places that were unique and enjoyable – Wild Coffee & Bistro tucked away in the hills of Doi Suthep – also – Chom Cafe & Restaurant – on the second ring road close to the intersection of canal road. Both are easily found on Facebook or google searches. Dinner parties – We attended a house-warming at the new Indian Consulate to celebrate their new facilities. 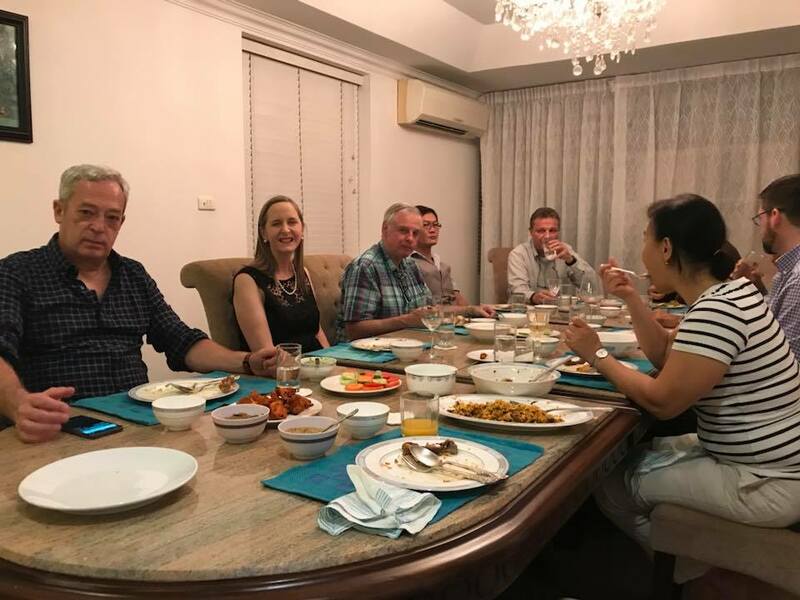 It was a nice informal gathering with the consular corps in Chiang Mai involving a lovely feast of delicious Indian cuisine – along with a very sumptuous dessert made by Rajni. Over the past couple of months we have also enjoyed catching up with friends for a birthday dinner & going along for dinner parties at a couple of other friends houses – it’s nice that they enjoy cooking and having dinner parties. Great nights out and to chat with others. Entertainment & Activities – The past couple of months have been quiet for attending different cultural & entertainment activities but we were invited by the Chiang Mai University Development Foundation to attend the Culture and Arts of Tianjin Performance at CMU convention center. The consulate joined other members of the Consular Corps and some 3500 guests. There was 90 minutes of fast paced, colorful and engaging performances of dance, music, martial arts and acrobatics. I also had the pleasure of meeting the CMU Foundation President and National Legislative Member Clinical Professor Niwes Nantachit, M.D. Thanks to the CMU Vice President for International Affairs and Alumni Relations for the invitation and being a very gracious host. Farewell lunch – Ace and I took the Embassy consular services manager out for lunch and afternoon coffee on her last trip to Chiang Mai before she is posted back to Australia – as a farewell. It was a fun afternoon with Kirstin. House and Garden – with the warm sunny summer weather and occasional rain storm everything is green, lush and in a fast past growing state. Like house ownership anywhere in the world weekly grass cutting and garden trimming is a household chore that needs to be attended to. While we do most of our own gardening we recently had to get some local Burmese lads into help cut back a few trees and shrubs that had overgrown – their younger energy and strength and reasonable labour rates were better than this old guy struggling to achieve the outcome – and they take away the trimmed rubbish. House maintenance – everyone knows that no matter where you live there is always things that go wrong, need to be fixed or attended to. I post about this so people looking to potentially live in Chiang Mai can get a sense of some of the everyday living expenses. Our coffee machine needed repairs recently as it was leaking – like many major appliances they can only be fixed in Bangkok so off the machine went – through a local distributor- Power Buy. It was away for 2 months for repairs; replacing a large rubber seal – at a cost of 1400 THB ($60). Happy with the result but a bit of a wait for a decent morning coffee! The air conditioner for our “office room” all of a sudden quit cooling (after 4 years) – the company that installed our systems were prompt to respond and the technician said the electronic control board was burnt out and needs replacing – apparently power outages and surges that occur from time to time because of storms, can cause this. Thank goodness they had one in stock so now waiting and for 3500 THB ($145) it was a simple fix – cool air again during the hot season. It was also time to change the drinking water filters in the osmosis purifying machine under the sink – something I can do – 3 filters involving sediment, carbon and resin – cost was only 1150 baht ($48) and getting a little wet. Then the front metal security screen door (inside night latch) broke – we are awaiting a part from the manufacturer – 1600 THB ($66) – to have it repaired. We also had to purchase a new printer and fax machine for the home office – not a big deal, lots available choice at many shops. We decided to get a Samsung laser inkjet from Office Mate – they were on sale. Happy with the product and how it performs for just over 5000 baht ($200). Internet Drama – we decided to move our fiber optic internet access point from an upstairs room to the office downstairs. Our ISP – Telecom of Thailand – TOT technician came to the house when I was away and did his thing. When I returned an found he had drilled into and ran a wire down the inside wall of the office I was less than impressed!! A call went out to our electrician to help out by preparing a better installation path – so the TOT technician could return and correct his mess -a simple solution? It all worked out in the end – 2 visits + an electrician (600 THB/$25). Wonder what next few months will require for maintenance – hopefully nothing. Animals – My last post talked about the death of our cat Lindsay. Since then our dog, Lex, and remaining cat, Lukas, have become closer friends. Interestingly Lucas no longer seems to be concerned with Lex and they often can be seen together and Lex enjoys following him around. Lex still loves his daily walks in the morning and evening down a nearby country lane. He is such a spoilt creature. He is off for a dog swimming pool visit next week at Pawtel – in Mae Rim. Shopping, Fresh Fruit & vegetables – one thing about Thailand is the abundance of fresh fruit and vegetables available at reasonable prices. Fresh pineapples and bananas are a lovely fruit to sample every morning at breakfast or to snack on during the day. We like to buy from the fruit market or more usually from a favourite roadside vendor we have found. 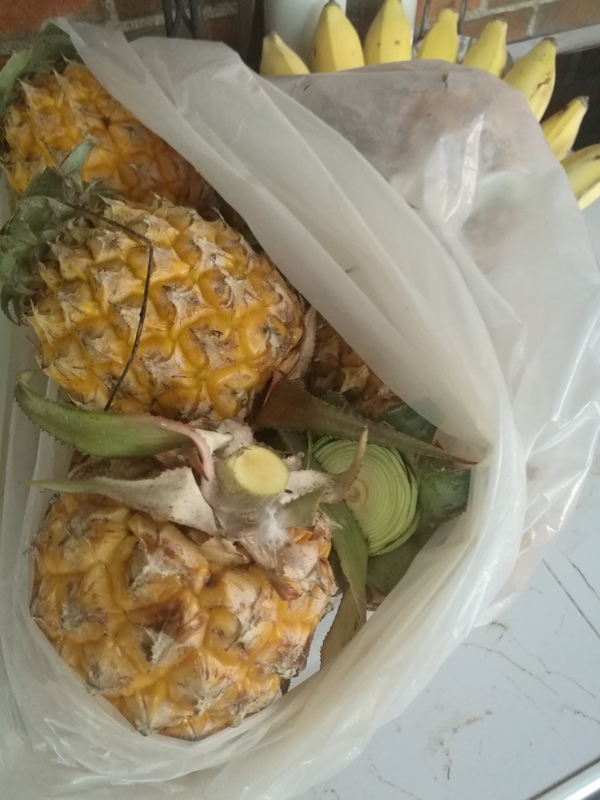 They are so cheap – 10 pineapples for only 100 baht ($4). When it comes to veggies we buy them from the Royal Garden Market near us. A bag of lettuce heads (6) for around 50 baht ($2). I must say that we eat more fruit and veg here in Thailand – it must be the weather! Kidney stone – In a previous post I mentioned I have been dealing with a kidney stone attack and had been undergoing extracorporeal shock wave lithotripsy treatment on a monthly basis at a local hospital centre. After 6 months of attempting to blast the stone away without success another strategy is called for. The stone has luckily moved down to the lower urinary tract so can now be accessed through a Ureteroscopy procedure. So I am booked into hospital on 1 June for a few days for this procedure and for after care monitoring. Let’s hope this rids me of this troublesome stone. I am on occasion having back pain and the need for pain killers so removing the stone should be a positive thing. My PCa – I share my experience with this disease to encourage other men to have their prostate health checked. I have been having prostate cancer marker (PSA) blood tests every few months since my original prostatectomy (surgery) in April 2016. The PSA monitoring has unfortunately shown a continuous rise ever since my surgery and I am now considered to have biochemical recurrent PCa. This means my initial primary treatment has failed. Recently I attended a Bangkok hospital seminar on this issue and have been extensively researching information on biochemical recurrence. This is to ensure I am informed, the best I can be, on this condition and next steps. With biochemical recurrence the next step is to try to find the source of the recurrence and then work out what and when treatment should be commenced. Luckily prostate cancer, in many but not all cases, is slower growing. The problem with recurrent PCa is that the type of salvage therapy treatment one can use/choose is often a difficult decision. The other conundrum is when to do something about it. Salvage therapy options, other than observation, are both toxic to the body and full of unwanted side effects that can greatly impact one’s quality of life. Making a decision is a risk assessment exercise about quality of life over quantity it seems – ensuring no over treatment but appropriate and timely correct treatment. So for now I continue to monitor my situation and explore the cause of the recurrence. I watch my diet, eat less meat, consume more fruits and vegetables, take some supplements and I am planning to undergo an advanced 68 Gallium PET/CT scan, suitable for lower level PSA, in the coming months in Bangkok to try to find the recurrence site. Then I will be able to discuss options and timing with my specialist – hopefully. 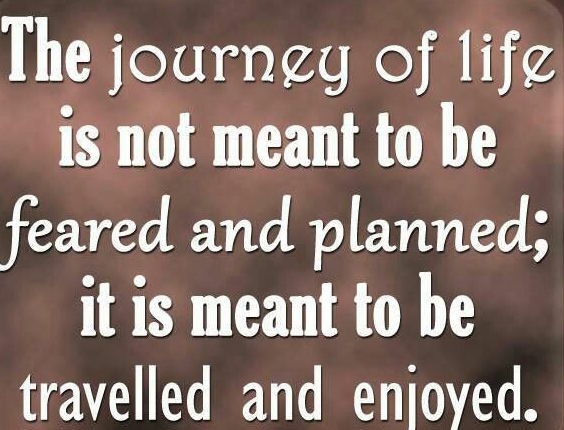 There are lots of statistics and examples to be guided by but, in the meantime – life goes on and it’s great. Keeping enjoyably occupied and having a purpose I believe is the key to being content. This bi-monthly consulate post highlights what has been keeping us busy with some work in this part-time role. Particular activities that took some time in the past few months has been planning for our local Anzac Day along with planning for an Australian Pavilion at an upcoming World Fair in Chiang Mai later in June. 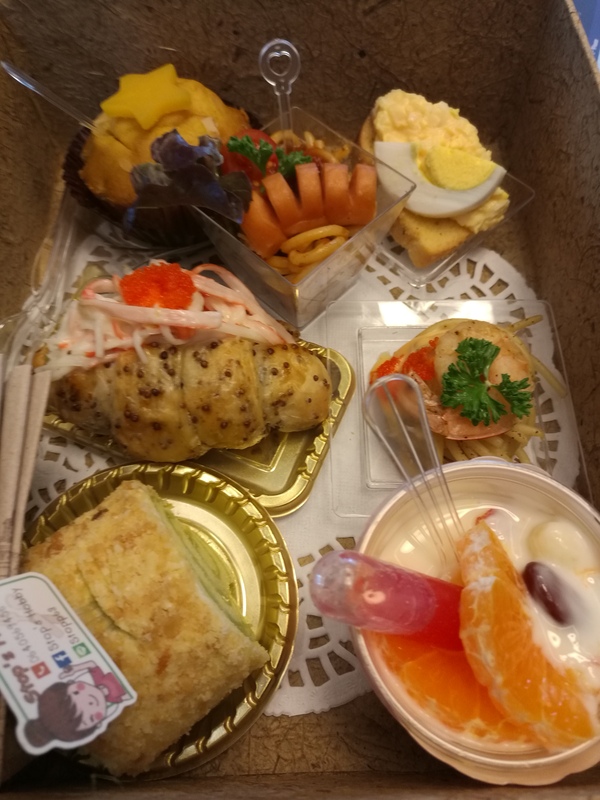 One of the tasks that was enjoyable was to speak with a caterer about a possible reception for the opening night of the World Fair/Lanna Expo 18, on behalf of the Australian Chamber of Commerce in Thailand ,- one caterer met us with a sample box – that I got to enjoy for afternoon tea. As a result of receiving phone calls 6 days a week, although I was meant to only operate 4 days a week, we have initiated an answering system to help manage phone calls and control operating hours to allow our “time off” to be ours and more private. After the 10 day World Fair in late June 2018 it will be time for a holiday break. What to do and where to go – no plans yet? So this is our snap shot of living tranquil in Chiang Mai – nothing special, just a simple and enjoyable life.